The SonTek/YSI FlowTracker Handheld ADV (Acoustic Doppler Velocimeter) uses our proven ADV technology in a compact, hand-held package to make accurate, high-precision water velocity measurements in natural streams, weirs/flumes, and open channels related to irrigation, stormwater, water treatment, and mining. Designed with the field user in mind, the FlowTracker easily attaches to top-setting wading rods and features an automatic discharge computation program that is based on USGS/ISO methods. Shallow-water 2-axis (2D) probe measures in depths as little as 2 cm (~1 in. ); optional 2D/3D probe is available. Discharge measurements - Note: The following link is to a Technical Memorandum issued by the U.S. Geological Survey's Office of Surface Water. 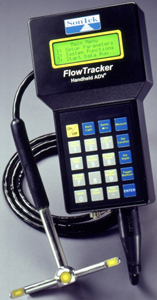 This memorandum [pdf format] describes the USGS policy on the use of the FlowTracker for discharge measurements. The information presented in this memorandum is a courtesy from the USGS, and should not be construed as an endorsement. Additionally, this memorandum is provided "as-is"; that is, the USGS does not provide support for this memorandum outside its own agency.